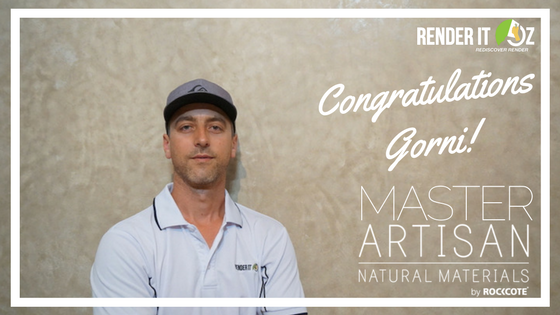 Render It Oz’s Gorni Cahani was this week recognised for his mastery of Tadelakt by Rockcote Australia and awarded the status of Master Artisan. One of only six in Australia, the Master Artisan status is awarded to artisans with considerable experience in using natural materials. In Gorni’s case, the bulk of his experience lies with the application of Tadelakt finishes. “I have been doing artisan type work for a couple of years now and decided early on I wanted to specialise in Tadelakt finishes so to be recognised for doing something you love is bonus.” Cahani said. Cahani’s Master Artisan status comes off the back of a recent trip to Marrakesh where he trained one-on-one with a Moroccan Malam (Tadelakt Master) and immersed himself in the history and traditional application of the lime based plaster. “The trip to Morocco was a homecoming of sorts for me. After working with Australian Tadelakt for a few years, it was enlightening to get back to basics and learn how the Moroccan people practice the art of Tadelakt. “The Malam, Majid mentioned he had learned a few things from me too so it became a learning exercise for both of us.” Cahani said. The trip was such a success, Render It Oz have organised a Tadelakt Retreat in Morocco in September 2018 for other Australian artisans and people interested in Tadelakt. “Anyone who works with Tadelakt or has an interest in the product will definitely get a lot out of the trip.” Said Cahani. For more information on Render It Oz’s Tadelakt Retreat, email gorni@renderitoz.com for a brochure and itinerary and check the website for details.